COMING SOON! Lead plates for 2 bolt timing cover and 2 bolt distributor, also conversion lead plates for 3 bolt timing cover to 2 bolt distributor. Top engine performance requires accurate ignition timing. Exeter Auto Supply's Ignition Lead Plate takes the guess work out of setting spark lead timing on the Ford Flathead V8's with front mounted distributor. The 21 precision timing marks allows you to easily and accurately set and adjust spark lead timing up to 10 degrees advance or retard. Made in the USA from the finest aluminum. Installation is fast and easy. 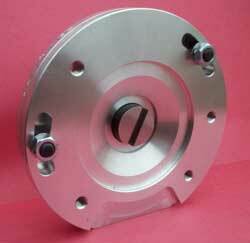 The base plate mounts to the timing cover, while the top plate mounts the distributor to the base. An indication mark on the top plate lets you know exactly where your timing is at. Changing your timing takes a matter of seconds. Just loosen the clamping nuts on the top plate and rotate your distributor to set your timing, retighten the clamping nuts and you are done! The lead plate can be used with stock points or electronic converted distributors. Ignition lead plate kit comes complete with all hardware, cam adapter, and instructions. Put the the best on your flathead today! Retail price is $195.00 plus shipping.